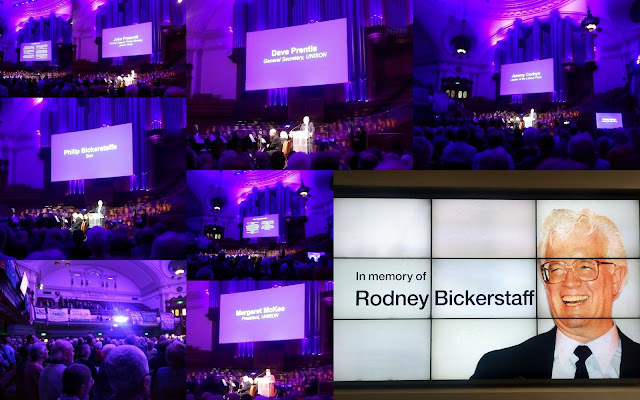 On Thursday I went to a packed out memorial in the Methodist Central Hall in Westminster to celebrate the life of our former UNISON General Secretary, Rodney Bickerstaff. The meeting was compered by UNISON National officer for Equalities, Gloria Mills, who had worked with Rodney for many years. We had marvellous music by the Dodworth Colliery Band and the UNISON staff Choir. The first speaker was an old friend of his, former MP and deputy Prime Minister, John Prescott. John praised Rodney for understanding that we need both the political (the Labour Party) and industrial (trade unions) wings of the Labour Movement to protect our people. Rodney "always left everyone with a smile". Not only a "union man" but a fighter "for social justice in Britain and across the world". He was a man "For the many not the few". Next our UNISON President, Margaret McKee, a catering assistant from Belfast, who gave a fantastic and moving speech about how Rodney was openly on the side of working people and especially a champion of low paid women. He was also very warm and personable, who loved swooping stories and to "enjoy the craic". She finished with a message of support and love to his family. Current UNISON General Secretary, Dave Prentis, reminisced about his former "friend and boss". "If you knew him you loved him... To his bones he was collectivist....A voice for the voiceless driven by a burning sense of injustice"
The actress, Maxine Peake, spoke about meeting Rodney at the People's History Museum in Manchester and made the comparison in looks to him and Buddy Holly but also compared him to Fred Astaire! John Sheldon, the former joint General Secretary of the civil service union PCS described Rodney's quick wit which he used to disarm opponents and his implacable opposition for many years to Margaret Thatcher banning workers at the GCHQ becoming trade union members. We then all stood up and sang "The Red Flag". Next speaker was Leader of the Labour Party, Jeremy Corbyn MP. Jeremy was a former official of NUPE (a predecessor union of UNISON) when Rodney was its Head of its NHS members. He reminded us that Rodney had done so much to bring about the National Minimum Wage and how the next Labour government will bring about a real National Living Wage. Jeremy said that Rodney would love the the fact that there was a colliery band and a choir at this memorial. He recognised that we need "Bread and Roses". Final speaker was his son, Philip Bickerstaffe, who spoke of the pride his family had in him and he had in his union. His dad described himself as a "Journeyman ranter" who always knew that UNISON grave diggers and cemetery workers would eventually get their hands on him. He finished with the famous Shakespearean quotation which he used to describe this 1970s trade union leader and adopted Yorkshireman "Now is the winter of our discontent. Made glorious summer by this son of York"
Our final song sung was the "The Internationale". While I had met Rodney on a few occasions over the years and he had been a strong supporter of my UNISON branch, I regret that when I bumped into him a few years ago in a cafe before a regional AGM he invited me to meet up for coffee and a proper chat and I never took him up on it. My loss.